Well, it’s official: winter is here! I live right next to Georgian Bay so we always get snow a little earlier than many but since it started last Thursday, the snow hasn’t stopped coming down. My small town has already transformed into a majestic winter wonderland. I was so excited when I saw the challenge colours over at the Colour Me…! challenge blog this week: warm brown, grey, and red tones. As I pretty much always do, I started my card in Silhouette Studio. I traced a free clipart tree and created the frame and mat. I had the birdhouse cut file from a project I did earlier in the summer, but it was a free file from Birds Cards. 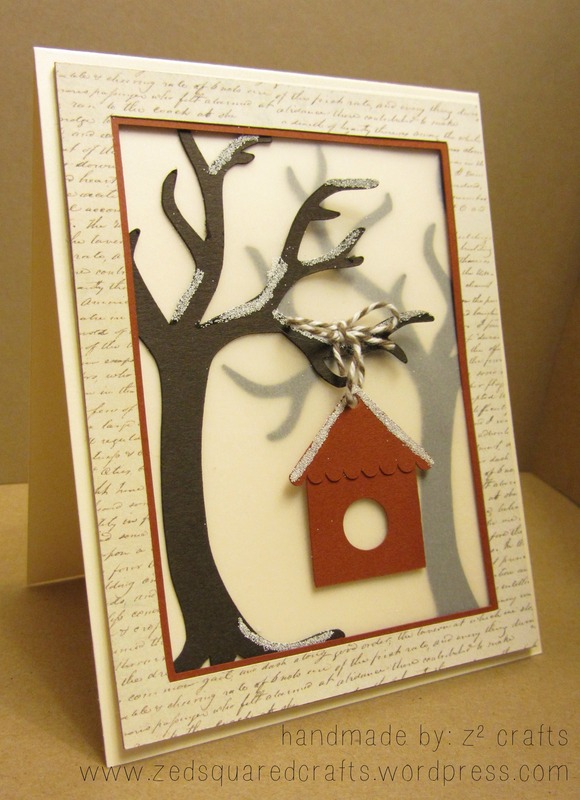 I used piece of My Mind’s Eye scripty patterned paper for the frame, a piece of Recollections cardstock for the terracotta birdhouse and frame mat, and SSS Dark Chocolate cardstock for the trees. I also used a piece of Bazzill vellum over top of one tree to soften the background. Using my Zig 2-Way glue pen, I sparingly applied a light touch of glue along the birdhouse roof and in some spots on the front tree. Next I sprinkled on some snowy glitter that I got at my local dollar store. I set those aside to dry while I assembled the rest of the card. I cut my cream cardbase to an A2 size (11 x 4¼”, scored at 5½) and another panel to the same size as the frame, 5¼ x 4″. Using Ranger Multi-Medium glue, I adhered the background tree to the cream panel and then with little drops of glue around the edges (where the frame would eventually cover) I adhered the vellum. I used the same glue to assemble the frame with its mat. Once the snow was dry, I adhered down the front tree over top of the vellum, leaving the branches to stick up a bit, and used a piece of grey bakers twine to hang the birdhouse and bring in the last challenge colour. For some extra dimension, I used clear foam squares behind the birdhouse . Finally, I used more clear foam squares to adhere the frame to the cream panel, and then my tape runner to adhere the panel to my cardbase. I used the Winter Sparrows stamp set from Lawn Fawn to add my sentiment (‘Season’s Tweetings’) to the inside of the card. Thank you so much for dropping by! Stay tuned for a Twelve Days of Christmas feature coming up on my blog. Have a great weekend! Wow this is gorgeous! I love the way you created the vellum frame. Such a neat looking card. Thank you so much for taking the time to share with us this week at Colour Me…! Sure hope we will see you again soon!!! What a fantastic use of these colours and to use vellum over one tree is a genius idea, you’ve created real depth to your scene. Thanks for playing along at Colour Me…!